Since 2003, our clients in Northern NJ have trusted Freedom Fence for the highest quality wood fencing, in Passaic County NJ and nearby communities. Whether you want to add a traditional finishing touch to a cottage with a white picket fence or a wooden privacy fence that blends seamlessly with the landscape around your pool, trust our team at Freedom Fence to design, make, and install the wooden fencing that you envision. Since we manufacture the wood fencing we install, Freedom Fence offers a broad range of styles, wood, and finishes. You’ll find our wood fences competitively priced and we have price points to accommodate most budgets. 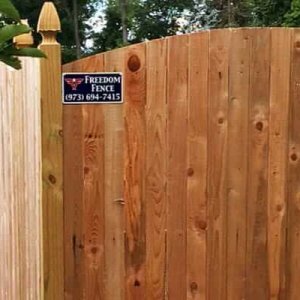 For a free consult and estimate for wood fencing in Morris County NJ, contact our team at Freedom Fence today! #1 Grade White Cedar: Attractive painted or left natural, these wood fences last 20 years when left untreated. Spruce: A high quality, yet budget friendly, choice material for your new wood fence. Red Cedar: Perfect for those wanting a high‐end premium wooden fence, this cedar offers a natural rich red tone to enhance the beauty of any landscape. For our wood fences, we offer a choice of 4 X 4 pressure treated wood posts or metal posts. Do you need more information about wood fencing in Sussex County NJ? Call (973) 694‐7707 to speak to a member of our Freedom Fence team today! If you opt for pressure treated wooden posts for your wood fence, our fence installation technicians will secure the posts using a mixture of sand gravel and Portland concrete. This provides a secure footing while allowing sufficient drainage to prevent rot. We use concrete to anchor metal posts securely. To learn more about our other fencing, railings, arbors, or our other fencing services in Bergen County NJ, contact our team at Freedom Fence today!